Whites Road originally crossed the North Coast Railway and continued to Oak Farm, established by James White (1843-1898) after purchasing the land from Courtenay Hele Fowell Spry in 1871. This became a very prosperous mixed farming and dairying property. 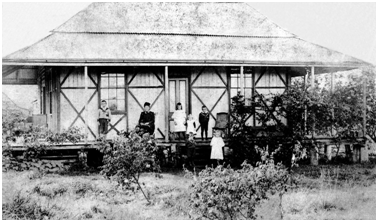 The farmhouse was located on the north bank of the North Pine River near the site of today’s Amcor Cartonboard Petrie Mill. James’ first wife, Angelina Elizabeth (nee Smith) died in childbirth in 1883, leaving him with ten sons and one daughter. His second marriage to Catherine Reid produced another four sons and two daughters. Six of the boys fought in World War I and two were killed in France on the same day. Two of the younger sons farmed the property before it was sold to APM (later known as Amcor) in 1946.